July is almost upon us and summer is just getting started. Well, by the calendar, that’s correct, but it usually starts in fact a few weeks earlier. It has gotten warm finally. Well.. hot actually but I’m not tired of it yet! lol The deck is going up slowly as time allows and we’re getting looms made. Justin, our oldest grandson is here to lend a hand for the summer & we’re enjoying his visit as well. I was sorting though some stuff and found these. They came with some loom things I was given by a widowed neighbor. His wife had been a weaver and there were some nice shuttles as well as a bobbin winder which I was extremely happy to see. but I haven’t a clue what these things are. They seem to have been made with standard doctor sized tongue depressors. If you know, would you tell me please? ← Happy Birthday, Hazel Rose! 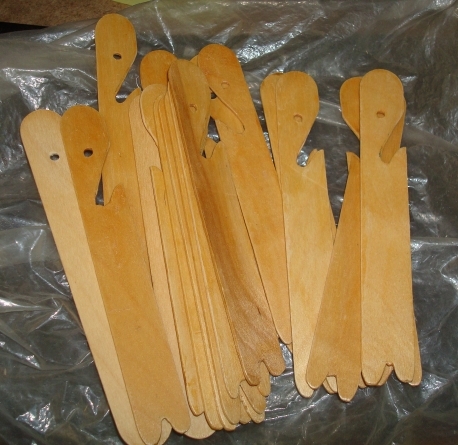 They are belt shuttles used for inkle loom, card/tablet, and narrow backstrap weaving. They are wound as Harma said above. The end of the thread goes through the hole in the handle, which prohibits the shuttle from dropping to the ground, eliminating a lot of stooping, if you let go of it while weaving. Thanks. It’s always good to know what you have. I found a home for some of them and kept a few, just in case.